Life’s too short not to eat fine food and spend time with wonderful people. You’ll be in the ultimate location to eat, drink and be merry at Hinterland House. From sharing a gourmet picnic overlooking the coastline, to enjoying a special meal out with family and friends, to whiling away the night on Byron Bay’s hottest dance floors: each of these highlights are an easy journey from your private hideaway. We’ve gathered up our favourite local spots for food shopping, dining out, shopping and nightlife in the Byron Bay area. It’s time to reconnect and celebrate. Within a minute’s drive you’ll have the excellent Bangalow Pub or our personal favourite, The Italian Diner (be sure to tell them you’re staying at Hinterland House when you book). Further afield you’ll find a delicious midday meal at Three Blue Ducks at The Farm. If you’re after something Mediterranean on a balmy evening, then head to Mez Bar or St. Elmo Dining Room & Bar in Byron Bay for modern tapas. Meanwhile, Izakaya Yu in Mullumbimby offers incredible Japanese cuisine. 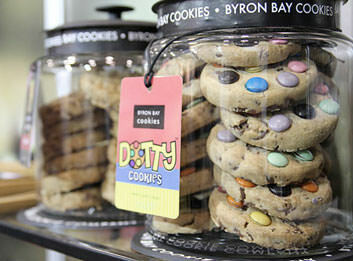 For a special celebration look to the Fig Tree Restaurant, Beach Byron Bay or Harvest in Newrybar. Food shopping is a pleasure when you’re staying in this region: think low food miles, the freshest of produce and a friendly smile included for free. Within minutes Bangalow Foodworks has all of your basics covered and is open until 9pm each day of the week. If you’re preparing a picnic, visit The Farm for just-baked bread and decadent pastries. Harvest Deli in Newrybar is another must-visit for delectable sandwiches and salads. Finally, take a drive to Ballina where you can pick up fresh local fish and prawns at Northern Rivers Seafood – after you visit the town’s giant prawn, of course! Byron Bay locals love to get together and you’ll find plenty of options if you’re searching for some nightlife. Balcony Bar & Oyster Co. is the ideal spot to start any evening off with cocktails and ocean-fresh oysters overlooking the main strip of Byron Bay. 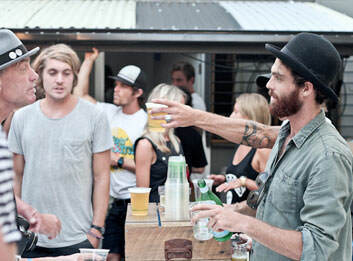 Ryce Byron Bay offers late night happy hours and live DJ sets on weekends, as well as tasty modern Asian food to share. Over on Lawson Street, La La Land offers a sumptuous setting for a Friday or Saturday night, beginning with elegant cocktails on the relaxed daybeds to dancing the night away to DJ shows. You needn’t go far for a spot of retail therapy when staying at Hinterland House. Wandering the historic streets of Bangalow you’ll find exquisite clothing and homewares in neutral shades at Island Luxe, as well as richly textured furniture, lighting and decor at Bisque Traders. 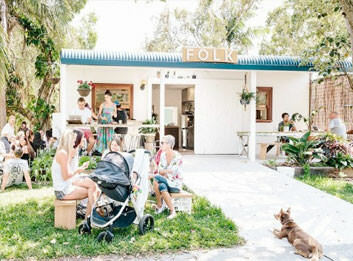 The Hills Emporium in Byron Bay offers up a curated collection of bespoke ceramics, clothing, jewellery and antiques. It’s also a delight to find yourself lost amongst the potted plants, textiles and leather goods of the nearby Newrybar Merchants. Take your time to explore, and you’ll find some extraordinary treasures to take home with you.